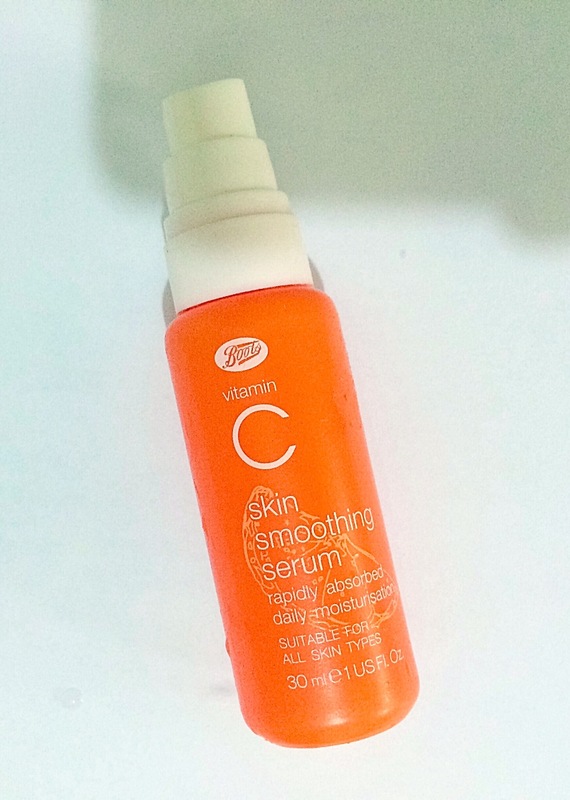 Today’s post is a review of the Boots Vitamin C Skin Smoothing Serum. I’ve been wanting to try out a Vitamin C serum for a long time now(especially the Murad and Radha ones) but they are always so costly(for such a little 30ml bottle…lol). Vitamin C has skin lightening, anti-oxidant and anti-aging properties(reduces the formation of fine lines, wrinkles and hyperpigmented spots and blotches on the skin). So you can imagine my excitement when I saw this product at an extremely affordable price. I had to try it out! Boots Vitamin C Skin Smoothing Serum is a rapidly absorbed formulation for daily moisturiation and to help improve the appearance of fine lines and wrinkles. Contains Vitamin C derivatives for enhanced whitening effects and Sodium Hyaluronate and Aloe Vera Extract to help skin feel firmer, more moisturised and resilient. 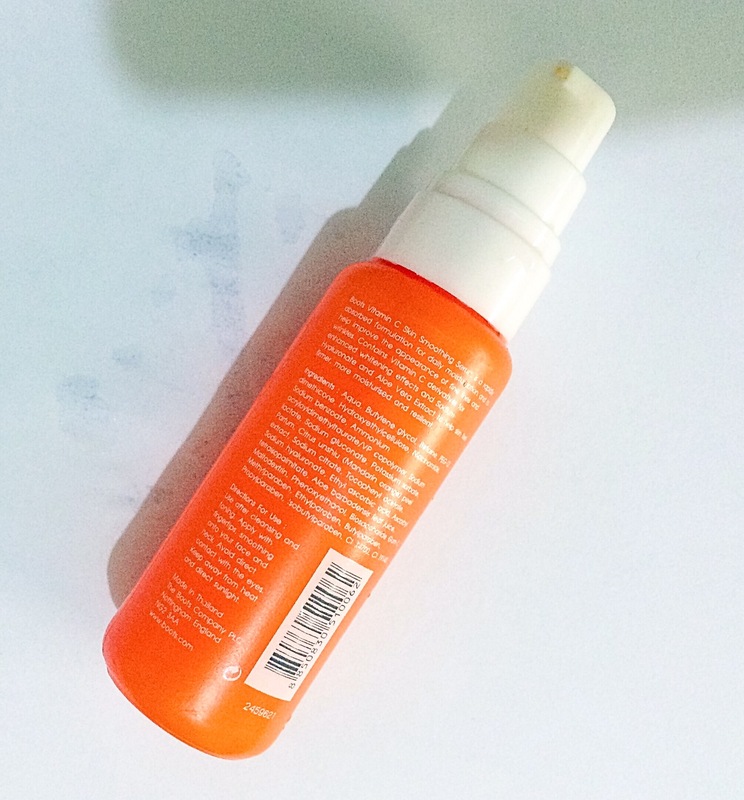 The serum comes in a cute orange spray bottle…most vitamin C serums I’ve seen have dark tinted bottles(to prevent inactivation of the vitamin by heat and sunlight, I suppose)..the bottle’s still cute anyway. The serum is transparent and has a very liquid consistency. When applied to the skin, it gets absorbed really fast into the skin and feels really comfortable. It does not make the skin oily and sinks right in. It also does not have a particular smell to it(for my scent-conscious people). It deeply moisturizes my skin and my skin feels well-hydrated after using it. However, I haven’t noticed any reduction in my fine lines or hyperpigmented areas. I haven’t noticed my skin getting firmer since I started using it either. Verdict: Would I repurchase this product? No, I wouldn’t. I’d rather save my pennies for the Murad Rapid Age Spot and Pigment Lightening serum or the Advanced Active Radiance Serum. I score it a 4 out of 10. Do you have a Vitamin C serum which works wonders for you?? Is it affordable…or not? Leave your comments, I’d love to hear your thoughts!! Getting value is key my dear!!! My dear, I hope it works for you though…I really hope it does! !